Sabrina Hersi Issa: The 'Year of the Woman' forced us to take a step back for every step forward. That isn't real progress. Sabrina Hersi Issa The 'Year of the Woman' forced us to take a step back for every step forward. That isn't real progress. Focusing on the inclusion of women in politics is misplaced if the structures that promoted our exclusion don't change. After the midterm elections, 2018 was increasingly hailed as "The Year of The Woman." 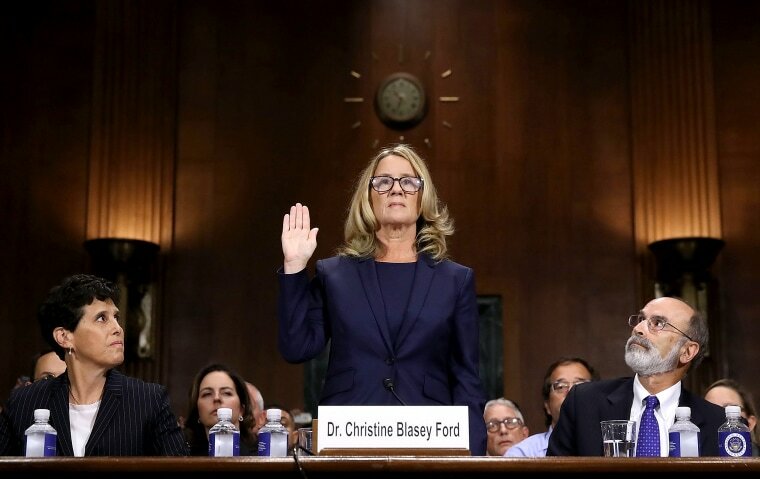 When women assume their rightful place at helms of power, it should not be hailed as a beacon of hope, but as a long-overdue and rightful rebalancing of the scales. "Women belong in all the places where decisions are being made,” Supreme Court Justice Ruth Bader Ginsburg said in 2009. Ginsburg was appointed to the Court in 1993, on the heels of 1992’s "Year of Women," which was called that when a record number of women won seats in the United States Senate following the courageous testimony of Anita Hill during the contentious Senate confirmation hearings for Supreme Court nominee Clarence Thomas, whom she credibly accused of sexual harassment. The Senate confirmed him anyway. It is flooring the ways little has changed but nothing is the same. When we mistake moments in our culture during which some women are being represented as mere cause for celebration, then we have missed the true call to interrogate ourselves and ask: Why did it take this much pain to get the world to care? Why are we increasingly reliant on the most vulnerable voices in our culture to serve as collective moral wake-up calls to problems we have long known existed, but which we have done little to correct? Our focus on the inclusion of women’s voices in politics and necessary culture change is misplaced as long as it fails to change the structures and practices that promoted our exclusion in the first place. If we can achieve this shift — one in which there is an expectation for progress for all — then we can create a force of momentum for the many political fights to come. We don't need another Year of the Woman. We need progress for women every year. To achieve this we must reject a reflexive negative reaction to leadership from those who do not fit factory-produced templates churned out by entrenched power structures. It means we must expand our capacity to hear the voices that challenge us to be better and become better, both for ourselves and for future generations. We cannot continue to rely on the most marginalized voices to be engines of progress without explicitly supporting those voices in leadership, to restructure power to be more inclusive. The hope that this class of newly-elected women represents is a familiar one for a culture that likes to think it believes (and believes in) women, but actually repeatedly relies on women to share our pain in order to demonstrate our humanity and thus push against political complacency. But already we see how entrenched power pushes back against the audacity of women who presume to lead. Take, for instance Alexandria Ocasio-Cortez, who dominated in a primary victory against a 10-term incumbent at the age of 28 and swept the general election where she earned nearly 78 percent of her district’s vote. Yet Ocasio-Cortez’s heightened visibility in this Year of Women has both a power and a vulnerability. She’s been relentlessly demonized by the conservative right — the news cycle in the weeks following her impressive primary victory was overshadowed with attacks for ignoring a no-name white male conservative political podcaster in California, a distraction from the issues on which her home district in New York elected her to focus. Her freshman orientation to Congress was derailed by a different conservative nobody who felt entitled to surveil and judge her wardrobe choices. To her supporters, Ocasio-Cortez’s accessibility to her community has helped demystify politics but that same voice and leadership style is already under attack by the entrenched party establishment leaders who are uncomfortable with the fact that business as usual is no more — all this, and she is yet to be sworn into office. And, in Georgia, Stacey Abrams made history in 2018 as the first black woman to become a major party’s nominee for governor — but her opponent, Secretary of State Brian Kemp, repeatedly abused his power overseeing elections in ways that mirrored voter suppression and disenfranchisement. Abrams, thus, had to fight entrenched interests trying to keep people from the polls while simultaneously supporting one of the most ambitious political field programs of the 2018 cycle. And though, like other liberal cause célèbres, she was ultimately unsuccessful in her race, her platform, profile and campaign strategy should have made her a politician to watch in 2020. Yet, her name is not brought up with nearly as much regularity as a potential presidential candidate as two other male candidates who also lost their respective races for statewide office — Beto O’Rourke and Andrew Gillum. And then, of course, there is Nancy Pelosi, the soon-to-be House Speaker with an unparalleled track record of leadership, which has not afforded even her any protection from sexist demands to step down from her role in party leadership, efforts largely spearheaded by a majority all-white male liberal centrist boy band. In a role in which legislative effectiveness is the objective measure of success, Pelosi’s detractors' case for her removal do not attack her ability to secure necessary policy victories, but do manage to cite a litany of sexist and ageist reasons. In the latest speaker race, Pelosi was attacked for being too old, for not being liberal enough, for being from California and of course, for being a woman. Even in the Year of Women, there are no shortage of men trying to seize back control of the power that they never ceded in the first place. Ultimately we must face the reality that the systems which oppress women and limit our access to power are not actually broken, but are working exactly as intended — and that it is our collective responsibility to build the world we deserve, not just women's. We cannot celebrate another "Year of the Woman" and then wait 25 more years to make significant progress. We cannot wait for another wave of brave women to buck systems that attempt to silence us, only to fail yet again, to prevail. Power concedes nothing without demand. We need to demand more, and keep demanding this year and beyond.